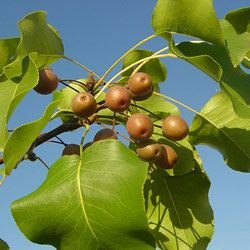 Pyrus calleryana is a tree to 15 m tall, older bark dark, rough, branches usually spiny, except in “Bradford” cultivars, winter buds finely gray-hairy; pears seeded in from fruit revert to spiny habit. Leaves alternate, broadly egg-shaped, to 8 cm long, dark green, glossy, margin toothed, fall color dark red, leafs out early keeps leaves late. Flowers white, to 2.5 cm wide, in dense clusters on short shoots, malodorous, attractive to bees, blooms march-April. Fruit fleshy, round, ca 1 cm wide dull greenish-brown, persistent, attractive to birds during winter. (Dirr 1990; Rehder 1986). Habitat: Very common street and park tree, escapes into open areas and edges, soil pH 5-7.5 (USDA, NRCS 2010). Tolerant of wide range of soils and environmental conditions. Invasive in some places (Gargiullo personal observation). Apparently believed to be sterile by some in the horticultural industry, that condition seems to be true only for some older cultivar (Gargiullo personal observation.